In the oilfield, many of your duties are performed alone. Therefore, it is vital to follow the proper oil & gas safety procedures put in place by the state and federal governments, as well as the specific methods required by the company you work for. In order to maintain the best personal safety you can while on duty, you should always keep these five important topics in mind. Working independently is vastly different than working in a group. You have to think ahead, and use both good judgment and common sense. As a lease pumper, you need to know what problems you can and cannot address on your own; as well as what risks you should or should not take. While threatening situations can occur, lease pumpers should never take any dangerous risks unless it is to avoid serious injury or death. Remember saving time is never worth your personal safety. When you’re used to working alone, common sense well alert you to plan ahead. This small tactic can not only save you time; but it can also be the difference between something serious happening, or a quick and easy repair. This is especially true if you want to be successful as a lease pumper. There are a wide variety of situations that can occur every day, and you need to prepare for different contingencies to help soften the blow. For instance, ‘What do you do if you experience problems in a remote area of the lease?’, ‘Do you keep your spare tire’s air checked?’, or ‘Do you have all the proper first-aid supplies on hand?’ These are the kind of things that will help you to avoid potentially dangerous situations later on down the road. Every oil worker should carry a portable phone or radio. Communication is key to working alone; and if a problem occurs, you have to be able to contact the necessary help. Always have contingencies set for any situation. For instance, knowing the location of the nearest public phone or house can be invaluable in the event your phone or radio loses power, becomes damaged, or you need emergency assistance in any way. Taking unnecessary chances or risks is the leading cause for lease pumpers to develop issues while working alone. For instance, if a leak is found at a coupling where it is only allowing a small amount of gas to escape; a quick fix would be to mount a collar leak clamp, which generally would take a lease pumper less than 15 minutes to complete. However, not all instances come complication-free. Circumstances can (and do) arise that will delay your process. This could include: trouble finding a suitable clamp or tool, a wrench drop causing sparks to ignite the gas, or a wide range of other options. Due to this, you should always shut in wells, and/or bleed the pressure off the line(s) before attempting any installations or repairs. Many major accidents where oil workers have died were the result of what initially started as small leaks or repairs. 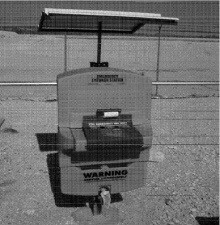 In most of these situations, the leaks or repairs were viewed as too small to pose any significant risks; thus chances were taken, and this carelessness ultimately resulted in the death of the field worker. Every accident that occurs is made up of bad decisions and unfortunate circumstances. No one was around to perform first-aid, if only the wind had been blowing that day, or if the gas hadn’t of accumulated; every situation is different, and a million and one things can change the outcome. While a lease pumper doesn’t need to constantly fear death to do their job, they do need to evaluate every action they can (or cannot) make, and determine how it impacts the potential outcome. If an action appears risky, the worker should always weigh their other options, and/or obtain the required help to reduce the risks to safer levels. A common view about safety is that it is like a winter coat. Once the weather is cold, a person will put it on; but when it gets warmer, they feel less inclined to use it. This is similar to work. When a dangerous situation comes along on during your duties, people become more concerned about personal safety. However, just because the crisis is averted, doesn’t mean safety concerns should disappear. A safe attitude should carry over into everything we do; whether you’re working, fishing, or driving home for the night. The way a lease pumper drives is often a good reflection on their attitude towards work safety. For example, speed limits are set as a safety precaution for motorists concerning how fast it is safe for a driver to go on a given road in good conditions (dry roads, fair weather, normal traffic, etc.). During the optimum weather conditions, many drivers will feel going a few miles over the speed limit isn’t a big deal; and in most cases, this is true as long as the road maintains ideal conditions. Unfortunately, these ideal situations can cause a person’s attention to wonder, such as a lease pumper thinking about all the tasks they have ahead of them for the day, making the driver no longer as alert as he was before. A light scatter rainstorm can create wet pavement in an area up ahead, an oncoming care-without warning, or a blown tire; there are hundreds of possibilities that can occur in the blink of an eye. However, by this point it no longer matters what happened or why; it is about the crash or injury. Every year people are severely injured over situations that could have easily been avoided. Things like driving while reading a newspaper, talking on the phone, or other circumstances that became more important than the person’s personal safety. To be a successful lease pumper, you need to make the aspect of safety as essential to your job as when you are driving a car. Just like our roadways have a variety of signs with different shapes, colors and meanings; the oil industry has their own standards of information used for providing information. Over the years, the appearance and meaning of the sign have been refined and standardized until every color, shape, and size used could indicate something from a distance (even before the person can read the exact lettering). 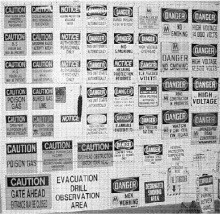 Typically these signs offer information about a potential danger, equipment or supply information, location of first-aid or fire extinguishers, or other safety related information; with most lease sites marked with general signage used uniquely to the oil industry. There are several different types of breathing apparatuses in field use. Generally, most lease pumpers carry their own personal air mask while working on the job. Some lease stores are known to stock additional air packs on the lease for personnel or visitors. 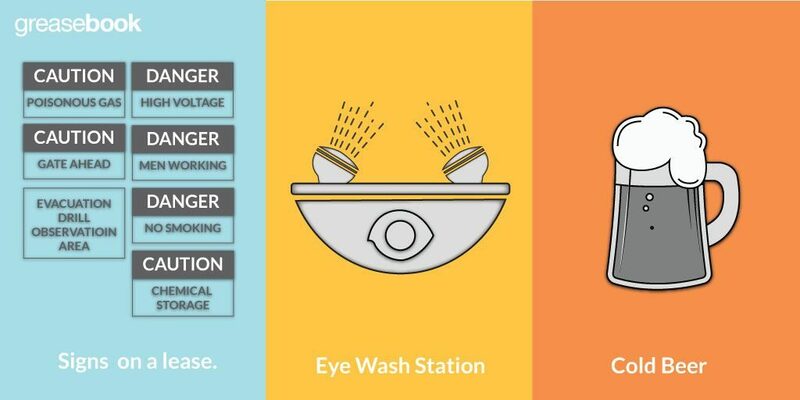 Eye wash stations are available around the lease in areas where there are high risks for eye injuries from chemicals or small particles. Workers should be aware of the different risks for eye injuries, as severe damage can occur in only a few short seconds. For instance, when gauging a tank and the lease pumper gets his or her eyes exposed to the hot gases rushing up out of the tank; a common reaction is to turn away into the cooler air. However, this will only close the pores and trap the gas inside your eyes; causing a painful eye experience for the next 24 hours or until the gas has the chance to escape or diffuse into the body. Along with knowing where the eye wash stations are located, lease pumpers should also keep an eye wash solution and lubricant within their first-aid kit. Goggles are highly recommending when gauging hydrogen sulfide-producing atmospheric vessels or when a vapor recovery unit has several ounces of pressure inside it; and are mandatory during any situation where you may experience flying projectiles. Earmuffs are mandatory for workers in situations where they may experience loud noises. Long-term exposure to these noises can cause damage to your hearing, or even interfere with your sense of balance. These specialized tools are used to reduce the risk of creating sparks that could ignite a fire in an explosive atmosphere. They are typically very expensive and made out of some form of brass. Most lease pumpers do not carry many spark-proof tools, and commonly only have a hammer and a small adjustable wrench on hand. The exact types of safety equipment used should be determined by what type of equipment will make the job safer. For example, some lease pumpers utilize back protection belts for those who are required to do a great deal of lifting; while others only use the appropriate safety equipment for their current work situations. However, typically the company you work for will provide you will all the safety equipment needs believed necessary for their lease pumpers. Is your appetite for oil & gas operating knowledge insatiable like ours? 😀 If so, check out the related article, Lease Worker Fundamentals to Hydrogen Sulfide Gases – it will surely pump you up!! !